A prefect option for families and groups of 6 or less, the full yacht charter! Often at less cost than 3 cabins on a traditional small ship cruise! Northern Dream offers comfortable staterooms, personal service, customizable cruise itineraries, a myriad of activities like kayaking and beach exploration, all at your own pace. Have smaller children? Not a problem! Perfect for families. The captain has years of experience in Alaskan waters, the crew prepares tasty meals and attends to your needs. 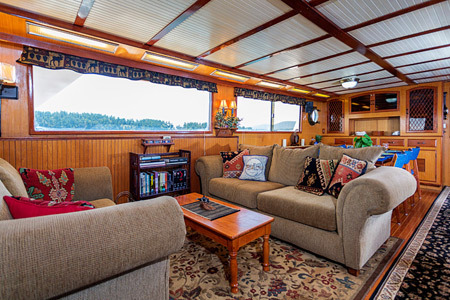 The “MV Northern Dream” is a spacious 65' Sea Ranger motor yacht. Spacious, with a wide beam, she rides smoothly and steady as she is also equipped with underwater stabilizers. The master stateroom has a king sized bed, vanity area and plenty of storage along with a spacious bathroom with it’s own tub. The Port and Starboard staterooms both have queen sized beds with their own private bathroom. The port stateroom also has a bathtub! Sight seeing is easy with full walk around decks, top bridge viewing area with a full 360 degree view along with a forward bow seating area. Roomy galley, dining and salon areas make the Northern Dream the perfect small cruise Alaska cruise ship. The day you arrive you will be ensconced in a cozy boutique hotel for the night. The following day you will board the Northern Dream. After the cruise you will disembark and spend your last night in a hotel with enough time to do a bit of sightseeing and wander the town. Yes, no rushing to the airport on the same day! (Hotel stays are included in vacation package). The day to day itinerary is open and flexible, customizable to the activites you like. Alaska Cruises & Vacations by Tyee Travel, Inc.